Sometimes the trees themselves share lessons with us about how to work with them, to talk with them, heal with them. These are often presented to me as mystery teachings from the trees themselves–and I’ll be sharing some of these teachings with you. The first of these is finding the face of the tree. I have found that each tree has at least one face and finding it can teach you a lot about that particular tree’s personality and energy. Finding the face of the trees will show you their individuality and unique personality–and yes, individual trees do have uniqueness of their own, both inside and out. This is similar to humans—all humans are humans, but we come from different ethnicities and different regions and those create variation. In the same way, all oak trees have a strengthening quality to them because of their nature: how they grow, their extensive root systems, their tannins, etc. But like people, each oak has his or her own personality and quirks. Finding the face of the tree gives one insight into those personalities and quirks that a tree possesses and gives mean for communication. What do I mean by the face of the tree? Usually, somewhere on the bark, there is a face or a part of a face–some variation of the bark that allows you to see a message. 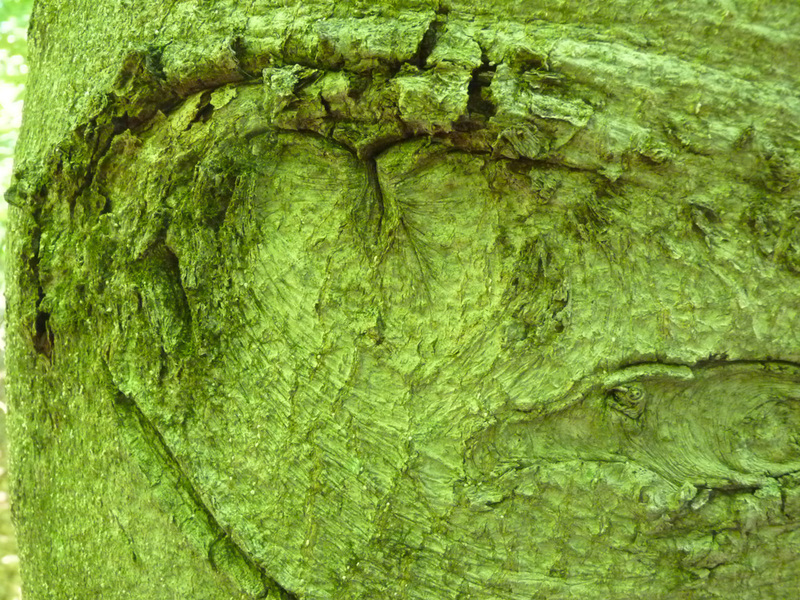 You may see an eye or some other feature that shows you the tree’s nature (one of the images below has a heart in the bark…you get it). The face of a tree is almost always found in its bark—look at the irregularities in the bark, the knotholes, bumps, or other features and you will find the face of the tree. Some trees may have many faces (like beech trees, which I’m using in this post) or smaller face that combine into a large face. If you directly address the tree at its face, you will more likely get a response. How high up the face may be gives you a sense of the tree’s accessibility and friendliness. Faces that are well off of the ground may indicate that the tree does not wish to be approached; faces that are near the ground and clearly accessible may indicate the opposite. Some tree species, like maple or beech, have many many faces present on their smooth bark. Other tree species, like some conifers, require a bit more studying to see the face. You can clearly see the beech’s face here–not to far up the tree. 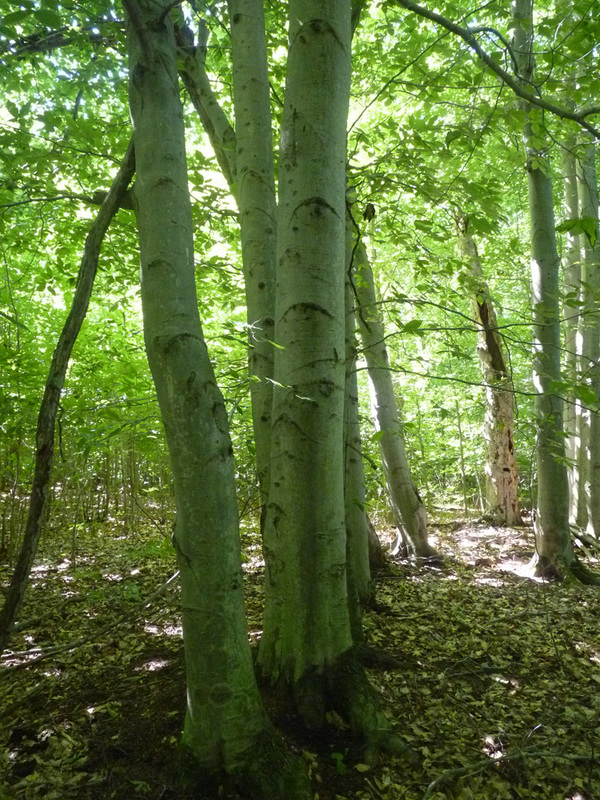 Beech trees are one of the best trees to start this practice with. 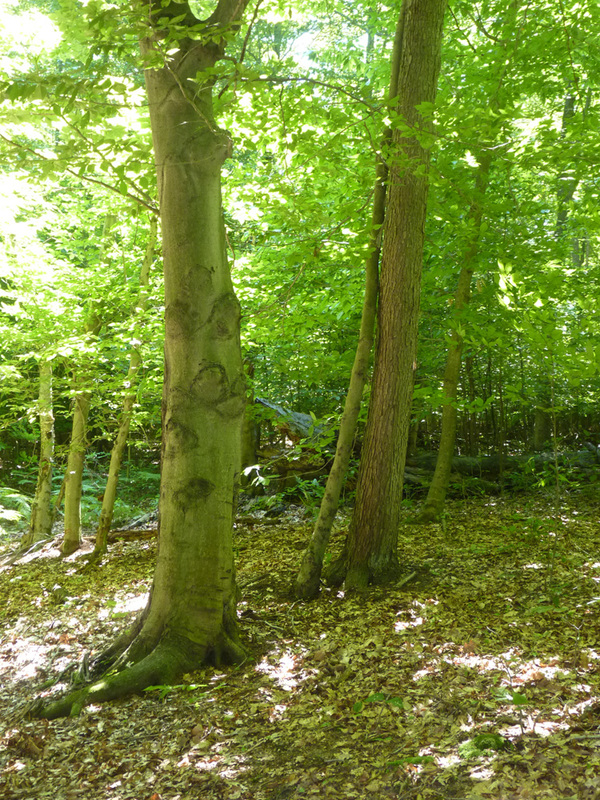 An oak and a beech–notice the many “faces” here! the oak, too, had a single face, high up, but it was harder to see. 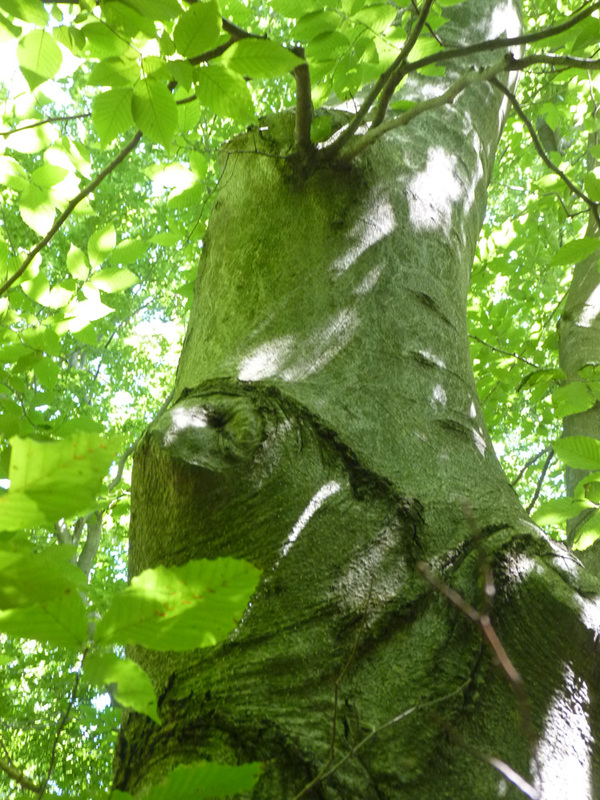 This beech has a heart in its bark–another kind of message in the bark. To find the face of the tree, sometimes you must sit across from the tree, and observe the tree. Observe it from different angles, observe it in different light. When the tree is ready, the face will be revealed to you. There are trees that guard themselves closely, or don’t usually have faces that are accessible There are also trees that are well known within the esoteric and nature-spirituality communities as having energy that is not compatible with humans–yew and elm being two such trees. I’ve found that hawthorns, also, take a bit of work–the hawthorn guards herself well and does not like being touched by most beings–but she will reveal a face after meditation and study. Again, the face of the tree can give you insight into the nature of the individual and the kind of work you can do (more on this in an upcoming post). Like our faces, which bear the brunt of our lifetimes—scars, lines, weathering and age—so, too, do trees exhibit such patterns on their faces. Faces may also be created due to cutting or other kinds of force–these faces often reflect the tree’s pain and can be used for land healing work. Once, when I was visiting a six-acre old growth hemlock grove in South Western PA, in the Laurel Ridge State Park, I was shown the face of a tree. 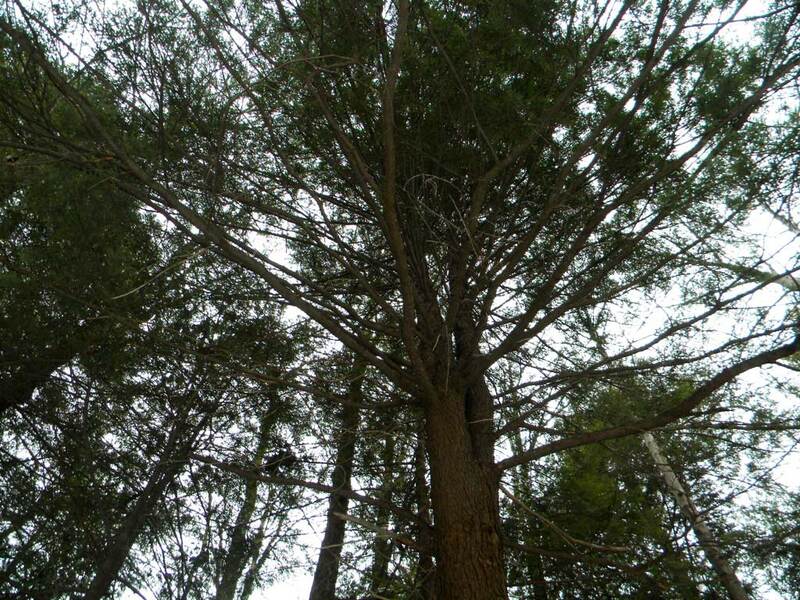 The old hemlock, over 5 feet across, bid me to come closer. He had a burl, and it had grown to have a lot of loose and dead bark on it and it was ready to fall off. He asked me to pull away a small part of the bark that was hanging and ready to fall—I did with very little effort, and when I stepped back, there was his face, clear as day in his wizened old trunk. There was the face of a wizard tree, an old man, looking back at me. I’ve since returned to visit this tree several times–the last time I was to visit, the tree gave me instructions which lead to me finding a much-needed gift for a friend. In this case, revealing the face of the tree lead me to a deeper relationship with the tree. In a second story, I met an ancient maple while living in Michigan. The ancient maple, bearing the scars of time, had many faces upon her weathered bark. I found that in meditating upon those faces, stories of the tree would flow into me. Different faces had different stories to tell. I encourage you to use this technique to find the face of a tree, and use the face to help connect to it. Spending time with trees is good for the soul. More tree love and some excellent tips for connecting with trees! I’m curious. What do you mean when you say that a tree told you things or gave you instructions? A voice, a feeling, an intuition? I have never had such an experience, and I’m not trying to be snarky, just genuinely want to know how you receive these messages and distnguish them from imagination/internal monologue. I think its a bit of all of these things. Many who work within a druidic tradition (or other kinds of nature-based spirituality) engage in practices that can help you be open to the messages of the world–and they come in many forms. Regular meditation, over a period of time, can allow you to clear your mind in such a way that external messages can come forth. Most of us don’t spend enough time managing our thoughts or directing them for this to happen. But daily meditation, especially in an outdoor setting, over time can allow us to be in a receptive state. With regards to imagination and internal monologue, again, its a matter of training and understanding. But at the same time, we should always question what we are getting in any form. My mentors have taught this to me as an “outer plane check”; that is, an external confirmation of something sensed or interpreted internally. Here’s what I mean. The face of the tree technique is something that I’ve been thinking about for a long time. After a series of meditations and observations, the concept continued to solidify in my mind. But was it just in my mind? A few months ago, while walking with two good friends in the forest, we came across a tree with an unmistakable face–a very human-looking face–and my friends both pointed it out –I didn’t have my camera with me that day, or I would have photographed it for this post! And we all commented on it and spent some time with the tree. I told my friends afterwards about the face of the tree theory and they were in complete agreement. So this experience served as one kind of “outer plane check” to my inner understanding. I suppose another one is simple–you can try it for yourself and see how it works. If it works then it works for you :). Thanks, that’s a lot clearer. I totally agree about the “outer plane check” to make sure that one’s beliefs and experiences are grounded in reality. Maybe next time I go for a walk in the woods, I’ll keep my eyes open for faces! Thank you for your kind words, Joanna! I really appreciate that you are reading and that you enjoy the blog :). A beautiful and very educational article for a newer Druid like me. I think I know now why I am so “drawn” to trees and why I sometimes feel as though they are in some way communicating something to me, or trying to. I need to work harder on opening up to them by finding their faces so that what they have to say can be easier understood by me. Glad you found it helpful! 🙂 Please share some of your experiences here if you are willing! I have lived on our land for the last 20 years . Some of the trees here have become old friends. I have meditated with them and spent so many hours gardening under and around them. Some I have planted as young trees that tower over me now. I bless them and hang decorations and bird feeders in some. The granddaughters and their friends dance under them at twilight with their friends at a special midsummer gathering every year. We’ve held a special welcoming ritual with the children in the family for all the local Nature Spirits and Fair Folk for decades. I agree with you about the faces in the trees. I’ve always recognized faces and personalities in them. I love Hawthorns and have planted five of them over the years here. One I planted right in front of our cabin. I spend more time with that one then the others, and it is very special to me. It is the tree I collect the berries from to make tinctures and cordials for strengthening the heart, and every year for Imbolg it is the Hawthorn in which I hang Brighid’s ribbons on the Eve of the Feast of Brighid (we call them brat Bhride- Brighid’s cloak in Irish) . The ribbons are then used as healing amulets for the sick. There is also a birdbath under it’s branches and flowers growing around it. I think because of all the love and attention, and the time I have spent with it that I do have a special bond with that Hawthorn. I love the idea of the ribbons for the Feast of Brighid. Lovely! I would love to see a picture :). I have spoken to and made friends with trees since I was a small child. I am now retired with grandchildren. About15-20 years ago, after receiving my Master Reiki Attunement, I was told I should not perform Attunements on other people until given the Go Ahead. (I had a Control Freak for a Teacher) so I went about giving the Attunements to Wildlife, Trees & Waterways. In regards to the Trees receiving Attunements, they truly heightened the Awareness of the Tree and their individual ability to strengthen & grow. I also found that a Tree must have 13 Chakras. Where as, people receive their Reiki Attunements, one every three weeks, to account for three, seven day cycles because we have 7 basic Chakras, I found Trees wished theirs every thirty-nine days, which equals three thirteen day cycles. After a Tree receives four Attunements, they then have the ability to Attune other Trees. Before you know it, the whole Forest is humming with Reiki energy. If you ever receive a Reiki blessing or healing from a tree, you will be as amazed as I was. It was so powerful, it almost rocked me off my feet. It was hard to describe other than it was very powerful and it was definitely Wooden. Thanks for sharing your experience with tree attunements. I’ve practiced a little Reiki (I finished Reiki level II, and my sister is a Reiki Master Teacher). The information about the Chakras in a tree is fascinating….I would love to experience the humming forest after you’ve attuned it! Wonderful! I had read other blog posts of yours that mentioned speaking with the Trees, and it was something I wasn’t sure I believed in or if it worked for me. But recently, I had an experience that really opened my mind to the possibility. I was volunteering for the DNR to help with some of their conservation work on Belle Isle. They were removing honeysuckle and buckthorn from the understory of the woods to help increase species diversity and give native plants an opportunity to reestablish themselves. A lot of the other volunteers knew very little about plant identification, especially in the winter, including the people who were applying pesticides (I have no idea why anyone other than a trained biologist was allowed to wield poison, but that’s a whole other topic). Anyway, amidst the buckthorn thickets there was the occasional young native tree–mostly oaks. Along the creek’s edge, some of these native trees had clearly been cut down by beavers–*not* saws. As we were all packing up to leave, to my horror I found that one of the other volunteers had slathered one of these beaver-cut stumps with poison. The stump was clearly that of a musclewood tree. Its twisty wood and smooth, blue bark was unmistakeable to me. But one of the volunteers had confused it with the smooth gray bark that they were identifying buckthorn by. The non-native shrubs we cut will easily grow back with vigor in just a couple seasons. But that lone musclewood must have taken years, maybe over a decade, to attain even its small size. Though it had been cut by a beaver, musclewood coppices and very well could have continued thriving. Who knows if musclewood will propagate in that spot again now? With one, ignorant swipe, the virtuous musclewood was extinguished. After I returned home, I prayed to the musclewood (praying to a tree is not something I’ve done before or since). I’m not sure if the musclewood spoke to me, or if it was just a moment of internal inspiration. But I had a clear vision of what I felt the tree must have looked like when it was still standing, and I had a sudden sensation that it was obvious what I had to do: nurture a new musclewood, and watch over it for the rest of my days. The whole thing might sound silly, but it’s a project I plan to see through one way or another. And I’ll be returning to those volunteer workshops with the DNR to watch those pesticide painters like a hawk, if nothing else. Sounds like a great tree experience, Donovan! The key, as I mentioned in one of my other comments on this post, is to train the mind. The mind needs to be trained to stop the internal chatter and simply be, in order for other things to be allowed to come in: feelings, words, etc. A lot of plant communication isn’t on the verbal level…but when you walk in a well-tended garden, you can feel the plants’ happiness (compared with an industrial field)…. Wonderful teaching. Thank you for your wisdom. Good to learn a bit more about tree manners. Some fantastic wisdom here about finding yourself in nature and finding the nature in yourself. Another great post reblogged from Druid’s Garden. Many thanks. Hope you all enjoy! No worries mate. Thanks for the mojo! Please read this magical post and the entire series on tree magic. I found druidgarden yesterday after posting about holding some tree branches and then finding some un-deerlike deer. Last night I dreamt of seeing a tree with such an animated face. Clearly this series is to be shared and savored! Beautiful Post.. I came via Linda’s at Litebeings Reblog.. I love trees and they hold such wisdom.. And I recently posted about the wisdom of the Silver Birch .. Thank you for your comments! Hope to hear from you again, Sue :). A few years back, a silver maple seemed to energetically pull me to it. I thought it was my imagination so I backed up and walked by it again. The pull was unmistakably stronger. I did not spend time with the tree because, 1) I was baffled by what it needed 2) the neighbors were watching… Yes, I’m ashamed I let that stop me. Well, three days later it was cut down. I still cry about it. I had no idea how I could have helped. With your series, I have a start. As you might imagine, I have more tree stories. I’ll need to involve myself in a tradition to begin training but your blog gave me a great beginning place. Thank you. Its tough with the neighbors watching…I usually tell the tree I’ll be back, and come back at a later point when no-one is around (early in the morning, in light rain, etc). Of course, if the tree is going to be cut, that’s a different story. I have one of my own to share–I was asked not a week ago by a tree if any more trees were going to be cut on the block. I said I wasn’t sure, but I hoped not, and continued walking to work. When I returned that day, that very tree was being cut. I would love to hear more of your tree stories. There are different kinds of training and traditions, some less obvious than others :). Different traditions do very different things and handle these kind of events differently. Regardless of the tradition you are considering, daily medtiation and energetic work is the backbone of any magical and spiritual practice. I have seen many tree faces and feel the tree spirits. I tried to pass this instinct on to my children and, now, my grandchildren. I had a life changing tree connection in Maryland where I lived for a few years. The house across the street from us had a beautiful on tree. It has a definite face of a Native American woman in it. Over time, in watching her every time I left my drive way. I also began to feel her. She had been there for a long, long time. Whenever it rain, she had tear channels down her face, except the rest of the tree would be wet and the years were dry. She became, like, a part of me. She was always there. My children and their friends lived her too. A lot of people think this is crazy. I am glad you really understand. I often felt a deep sadness within her. It shook me with it’s depth. She told me that she was put there long ago as a punishment. I do not know for what. At one point, it was like her sadness was revealed along with my own sadness that was increasing with the discoveries of serious problems in my private life. Her burden was as strong as mine. One day, I dropped to my knees and prayed that she be released. She had done her time and she was ready to join her ancestors. The neighbors that owned the home that she lived on absolutely hated me. They hated for me to look at her. They were horrible people. Absolutely amazingly, the morning after my prayer. I walked outside to get my mail. The neighbors were setting outside waiting for me. The shock on my face as I look ahead made them throw their heads back and laugh at me. I stood frozen in my driveway as I saw that she was cut down to a very small trunk with some knobby roots. I surprised my neighbors deeply when I began almost, okay actually, hysterically laughing and crying at the same time. Miraculously, my prayer was answered and she was free. I felt like I could walk to the moon. SHE WAS REALLY FREE! Over time, I realized that I too had been freed the same day she was. A few rough years later, I too, moved home to the lands of my ancestors just like she did. Her journey took hundreds of years, i, fortunately, did not take that long thanks to her. Thank You for your article! It is amazing. Wow, what a story! Thank you so much for sharing. Do you think your neighbors purposefully cut the tree down to get at you in some way (while the whole time answering your prayer?) That seems to be what you implied in the tale–and all the while, they were doing good work in the universe! It makes me wonder what else the trees carry. I know that they can carry other kinds of energy, especially placed there by people. This gives me such deep insight on the faces in the trees. Thank you. I know that they cut it down to get at me. They were really confused when I was celebrating right in the driveway. Sorry for taking so long to reply. I definitely know tree spirits are real. What about trees that were a hundred years ago planted out in the open on or near old graves or entire list cemeteries. Think of the spirits in them. We do not know that story. It has to happen some tree spirits evolve from this. My great grandmother has a giant Magnolia Tree on her Grave it feels holy to stand beside it. She is like the guardian of the entire cemetery. According to family stories and pictures, she was a beautiful, great guardian mother in life too. I have already taken my Grandchildren there to see her. I have peace that my daughter is buried right beside an old cedar tree. Cedar is also a protector. To smell it while visiting is calming for me. I might be looney, but I am a happy looney. I spent six months meditating on the cedars. They are really incredible. I think that people 100 years ago (and even before that) knew a lot more than we do about trees :). Thanks for your response! You have such positive energy. You live you souls passion. I Love It! I will read on cedar trees. Thanks for inspiring me! I’m compelled to tell my favorite tree story. When I was in 3rd grade, I would feel drawn to the trees and often spent more time reading in their laps – as the roots at their base were raised – during recess and lunch. I grew a particular attachment to one specific tree (unfortunately, as I was 9, I never found out what type of tree it was). One day, I had forgotten my lunch, and had no money. The tree had a hole in one side and told me to reach in. I found $5. I’ve been seeing these faces about a year now. Most every tree has these incredibly distinctive eyes, and once you notice a few you shift very quickly into a realm where nature erupts into focus. What was strangest at first was the juxtaposition of these expressive faces of trees with the dull and grey of urbanized places, in which many trees are planted in small squares of dirt, their roots left to contend with the concrete. My developing ability to personify these plants, and an increasing number of spiritual encounters with the natural world as I began to do so, brought into my consideration the potentiality of plant consciousness, which I now must say I fully suspect. I now plan to pursue plant perception (a field called plant neurobiology, a misnomer obviously) in college. It’s a remarkable thing the trees develop these eyes. They allow us to humanize them. Arden, you are definitely on the path to deeper awareness. There are some good books on the subject, although, they may not be caught up with the newest research you will be studying in college :P. The Secret Teachings of Plants is one such book that I found very useful in developing my perception and awareness of plant kingdoms :). I like that you talk about street trees. Street trees really need our love. I feel their pain constantly. It has been found that street trees that are planted in coordination with the people living on the street, who will care for them and watch over them have much longer happier lives. As it is, street trees planted in little squares of dirt without anybody really noticing have an average life span of 7 years. Reblogged this on The Paperback Writer. I’ve started to work through the techniques you suggest for connecting to trees. And I’ve found that once I start looking for the “faces” of trees, I see them everywhere I go! Interesting, I find many of the faces I see in my area resemble owls. Yes! Those trees are like a wise owl–those owl trees have such wisdom :). What about an Oak that has broken about 20 feet up it’s trunk and toppled (it’s decaying trunk lies in my backyard) but still lives, hosting squirrels, raccoons, hummingbirds in the summer, crows and mockingbirds, cardinals and chickadees. This Oak is in the corner of my backyard, at the center of a cross where four backyards meet. It seems hollow, but grows still. I tend to him/her and prune some dead wood. The other neighbors ignore the Oak. Is this Oak still able to communicate do you think? I am not home to go out there right now and find it’s face. [Here in the tropics I am marveling at the beautiful Silk Cotton trees. Nearby to the cool hillside glade where they are living I find cow paddies in the sun with bluish mushrooms growing from the centers, tee-hee. As I am reading about trees tonight a bat came into my apartment, flew around a bit, and then found its way out somehow. Blessings!